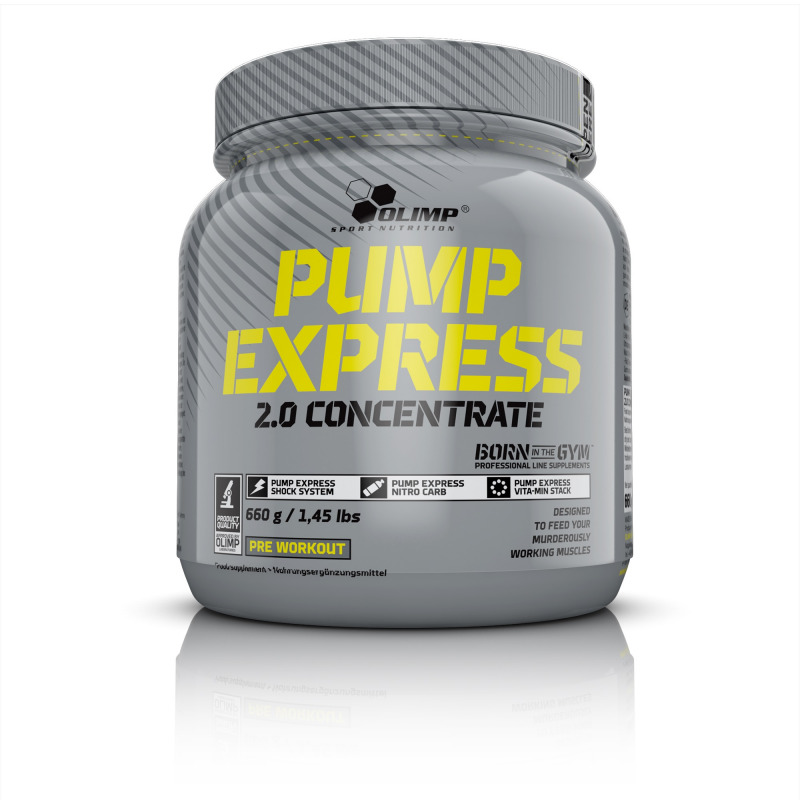 PUMP EXPRESS® 2.0 CONCENTRATE van Olimp is samengesteld vanuit 3 verschillende formules. Ten eerste de Pumped Nitro Express. Dit is een samenstelling van verschillende essentiële aminozuren en koolhydraten. Deze ingrediënten zorgen voor het maximale spierherstel en spieropbouw. De tweede formule in Pump Express 2.0 is Shock System. Hierin bevindt zich alleen al 3400 mg Creapure, Creapure is de meest zuivere creatine en staat bekend om de opneembaarheid in de spieren. Daarbij bevat deze formule ondermeer cafeïne. Cafeïne zorgt voor extra energie tijdens je workout en bevordert de focus die je nodig hebt om optimaal te presteren. De laatste stack in Pump Express 2.0 is VITA-MIN Stack. Dit bevat een complex van essentiële vitaminen en mineralen. 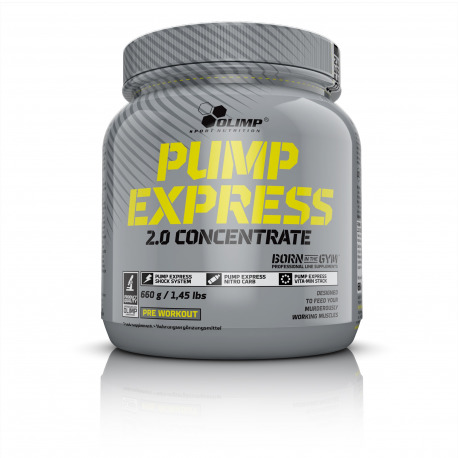 Pump Express 2.0 is een compleet product wat jou absoluut gaat helpen tijdens een workout! Ingredients: 25,3 % complex of carbohydrates (dextrose, WaxyMaize - high molecular long-chain waxy maize starch, maltodextrin, isomaltulose*) 11,5 % creatine monohydrate, 8,4 % L-arginine hydrochloride, 8,1 % L-leucine, 6,1 % L-citruline malate, 5,1 % L-glutamine, 4,1 % L-isoleucine, 4,1 % L-valine, 4,1 % L-tyrosine, acidity regulator - citric acid, 3,4 % taurine, aromas, 2,1 % magnesium oxide, 1,7 % calcium salt of orthophosphoric acid, 1,7 % cystine (a source of L-cysteine), 0,95 % potassium salt of orthophosphoric acid, 0,42 % green tea extract, 0,34 % caffeine, 0,27 % vitamins: (L-ascorbic acid – vit. C, DL-alpha-tocopheryl acetate – vit. E, nicotinamide - niacin, D-biotin, retinyl acetate – vit. A, calcium D-pantothenate - pantothenic acid, pyridoxine hydrochloride – vit. B6, cholecalciferol – vit. D, pteroylmonoglutamic acid - folate, thiamin mononitrate - vit. B1, riboflavin – vit. B2, cyanocobalamin – vit. B12), sweeteners – acesulfame K, sucralose; anti-caking agent – calcium phosphate, colours: carmine, riboflavin (orange flavour), riboflavin (lemon flavour), carmine (forrest fluits flavour). 25,3 % complex of carbohydrates (dextrose, WaxyMaize - high molecular long-chain waxy maize starch, maltodextrin, isomaltulose*) 11,5 % creatine monohydrate, 8,4 % L-arginine hydrochloride, 8,1 % L-leucine, 6,1 % L-citruline malate, 5,1 % L-glutamine, 4,1 % L-isoleucine, 4,1 % L-valine, 4,1 % L-tyrosine, acidity regulator - citric acid, 3,4 % taurine, aromas, 2,1 % magnesium oxide, 1,7 % calcium salt of orthophosphoric acid, 1,7 % cystine (a source of L-cysteine), 0,95 % potassium salt of orthophosphoric acid, 0,42 % green tea extract, 0,34 % caffeine, 0,27 % vitamins: (L-ascorbic acid – vit. C, DL-alpha-tocopheryl acetate – vit. E, nicotinamide - niacin, D-biotin, retinyl acetate – vit. A, calcium D-pantothenate - pantothenic acid, pyridoxine hydrochloride – vit. B6, cholecalciferol – vit. D, pteroylmonoglutamic acid - folate, thiamin mononitrate - vit. B1, riboflavin – vit. B2, cyanocobalamin – vit. B12), sweeteners – acesulfame K, sucralose; anti-caking agent – calcium phosphate, colours: carmine, riboflavin (orange flavour), riboflavin (lemon flavour), carmine (forrest fluits flavour).